Having a firm purpose in life may help to dampen the ravages of Alzheimer’s disease, a new study reports. A sense of purpose in life – that believing what you do matters, and that you are doing good and on a meaningful path – has been shown in earlier studies to contribute to greater well-being and better overall health. This latest study showed that it may also help to protect the brain against the damage of Alzheimer’s. The findings come from Rush University Medical Center in Chicago, where researchers have studied more than 1,500 seniors since 1997. All were free of dementia at the start of the study. The participants all underwent yearly check-ups and assessments to determine their physical, psychological and cognitive health. To measure how strong their sense of purpose was, they were also asked to rate their reactions to statements like “Some people wander aimlessly through life, but I am not one of them,” and “I feel good when I think what I’ve done in the past and what I hope to do in the future,” responding on a scale of 1 to 5 whether they strongly agree or strongly disagree. High scorers on the psychological profile of sense of purpose were defined as those who had goals in life and a sense of directedness; felt there is meaning to their present and past life; held beliefs that give life purpose; and had aims and objectives for living. Low scorers, on the other hand, lacked a sense of meaning in life; had few goals or aims; lacked a sense of direction; did not see the purpose of their past life; and had no outlook or beliefs that gave life meaning. In the study, 246 participants died, and their brains were autopsied for signs of plaques and tangles, which build up in the brains of those with Alzheimer’s. As plaques and tangles accumulate, memory and thinking skills tend to deteriorate. But many older people who have relatively large amounts of plaques and tangles in their brains do not develop serious memory problems. One theory is that these individuals may have a high cognitive reserve – an enhanced network of interconnections between brain cells that protects against cognitive decline. If some parts of the brain are damaged by Alzheimer’s, other healthy brain areas may help to compensate for the losses. The researchers sought to determine whether having a strong purpose might bolster the brain, perhaps by strengthening cognitive reserve. They examined how many plaques and tangles present in in the brains of those who had died, and compared it to how they had scored on their earlier sense of purpose surveys. Those who scored high on the sense of purpose survey were just as likely as to have plaques and tangles in their brains as those how scored low, the study found. But despite having the same amount of plaques and tangles, those with a strong sense of purpose did tend to score higher on tests of memory and thinking. While developing a strong sense of purpose is no guarantee that someone will not get Alzheimer’s, it may help. As researchers continue to search for new ways to treat Alzheimer’s and alter its course, any measure that may help to protect the brain may be wise. 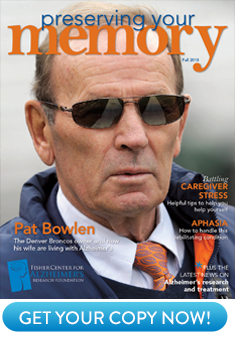 Patricia A. Boyle Ph.D., Aron S. Buchman, M.D., Robert S. Wilson, Ph.D.: “Effect of Purpose in Life on the Relation Between Alzheimer Disease Pathologic Changes on Cognitive Function in Advanced Age.” Volume 69, Number 5, May 2012.